Mix all the ingredients for the relish and put aside. Blend all ingredients except for the oil. Add the oil slowly until emulsified and season with salt and pepper. Saute the eggplant and onion in the olive oil over medium heat until soft (about 5 minutes). Add the vinegar, spices and pickles and mix well. Place into a bowl and add the herbs. Season to taste with salt and pepper and refrigerate until needed. Heat the clarified butter in a large nonstick pan. Coat the salmon with the cajun seasoning and cook about 3 minutes each side (you want the salmon to be pink inside). Place the eggplant salsa in the center of 4 bowls/plates and warm in the oven or microwave. 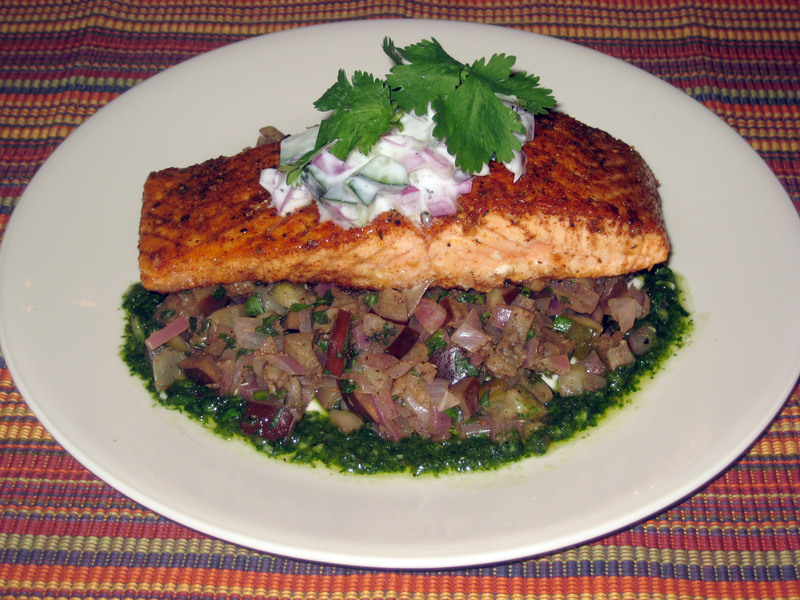 Place the salmon on the salsa and drizzle the food with the cilantro vinaigrette. Place cucumber relish around the plate and garnish with cilantro.